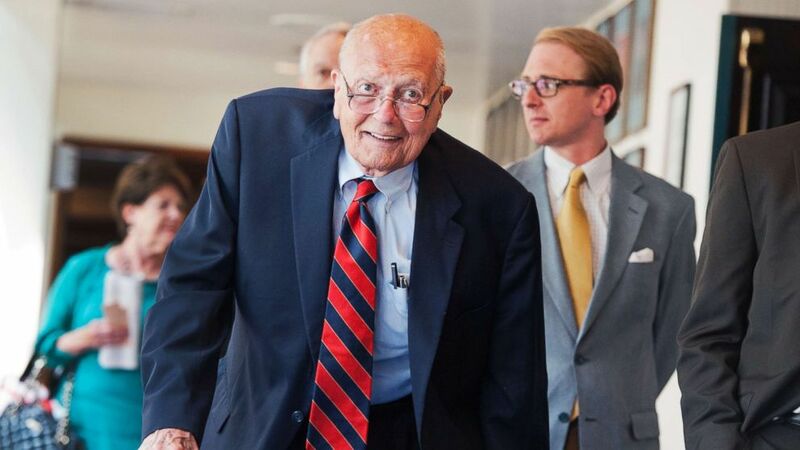 The longest-serving member of the House will have a Washington funeral Thursday. At Rep. John Dingell’s funeral service on Tuesday in Dearborn, Michigan, former Vice President Joe Biden started his eulogy with a laugh. Elected to seven terms in the Senate, Biden reflected on his time working with the Dean of the House, calling Dingell one of the few members of Congress he viewed as a real role model. “I met a lot of great women and great men and there’s only a few that I looked up to. I admired almost everyone I worked with, but a few I looked up to, who I knew were better than I was at what they did. I knew they were more successful at what they set out to do than I was, and John Dingell was that man,’ Biden told the congregation. (Andrew Harnik/AP) A hearse carrying the casket of former Rep. John Dingell, D-Mich., drives along the East Front of the U.S. Capitol, Feb. 12, 2019, in Washington. Biden was the only scheduled speaker to make it to the service. Democratic Rep. John Lewis and Republican Rep. Fred Upton were also scheduled to speak but the military planes they and several other members were on were forced to turn around because of bad weather in Detroit. 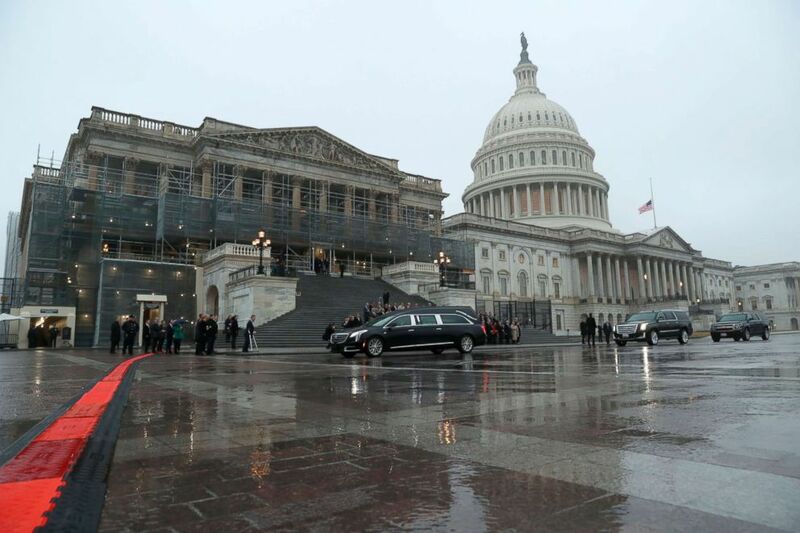 Later, on Tuesday afternoon, House members and other admirers stood on the U.S. Capitol steps in Dingell's honor as his casket was driven by ahead of a Washington funeral on Thursday. During his eulogy, Biden spoke directly to Rep. Debbie Dingell about their shared experience of losing a spouse. (Bill Pugliano/Getty Images) Congresswoman Debbie Dingell arrives with former Vice President Joe Biden and his wife Jill Biden, for the funeral of her husband former congressman John Dingell at the Church of the Divine Child on Feb. 12, 2019, in Dearborn, Mich.
“I know from experience as well that losing John is like losing part of your soul. He was your soul. But what an amazing soul he was,” Biden said. Throughout the eulogy, Biden spoke about his admiration for Dingell, saying “dignity” was in everything he did. “He gave me confidence. He made me believe more in myself more than I had. John had that special capacity to do so. Because when you are with him, you knew you were with greatness,” Biden said. Biden also reflected on Dingell’s accomplishments throughout his historic career. He said they read a list of America’s finest moments, citing his work on health care, specifically. The eulogy was a mix of heartfelt messages and jokes -- often at Biden’s expense. “What a guy, man, I’ll tell you what —- and he knew the difference between a hot mic and a cold mic,” Biden said to laughs while crossing himself. Biden spoke about his shared passions with Dingell -- many of the same themes he spoke about on the campaign trail in 2018, and in his public speeches this year -- focusing on the dignity of work, and speaking out after the white nationalist protest in Charlottesville, Virginia. “I spent a lot of time trying to figure out how to respond to it and wrote an article in Atlantic magazine. John summed it up in one sentence. He said, ‘I signed up to fight the Nazis 73 years ago and I'll do it again if I have to. Isn't that John?” Biden said to applause.